Brands don’t just want to sell stuff, for today’s marketer, it’s about going the extra mile. The goal is to surprise and delight. The approach was listed as the third most important benefit consumers want when joining a loyalty program, according to the recent ‘Share The Love’ report. But the practice works outside of loyalty programs too and is a great way for brands to curry favour with potential customers. We invite you to sit back and prepare to be surprised and delighted by these brands and their attempts to charm the socks off consumers. Chain mail used to put the fear of death into poor, unsuspecting recipients but Schweppes turned a negative into a positive with The Cocktail Chain Letter. Developed by Aussie experiential agency Traffik, the ‘letter’ made its way around Melbourne, delivering refreshing beverages to unsuspecting residents. Who doesn’t wish Tim Tams grew on trees? 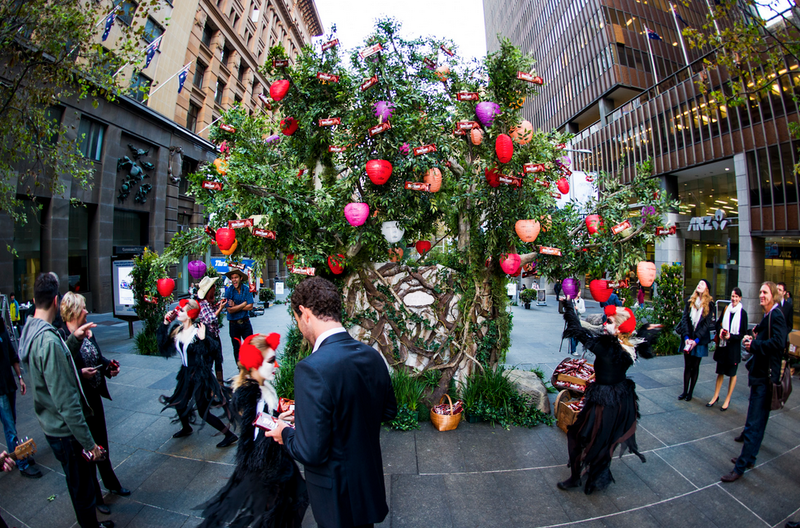 In 2012 Arnott’s granted this very wish in Sydney’s Martin Place with the Truly, Madly Tim Tam Orchard, put together by experiential agency Mango and DDB Sydney surprising and delighting Sydney’s corporate types. When Cadbury’s Joyville steam train rocked up to Redfern station in Sydney, conductors alighted the train, armed with blocks and blocks of chocolate, delighting the crowd. The arrival of the train was turned into a TVC. For Jetstar’s 10th birthday, the budget airline celebrated with a giant game of pass-the-parcel, executed by agency The Royals. Giving away free flights, those lucky enough to have the music stop on them, so to speak, were able to choose what type of person they wanted to pass the parcel on to. Spreading the love on a Swedish college campus, Coca Cola installed a special coke machine which spat out little presents. 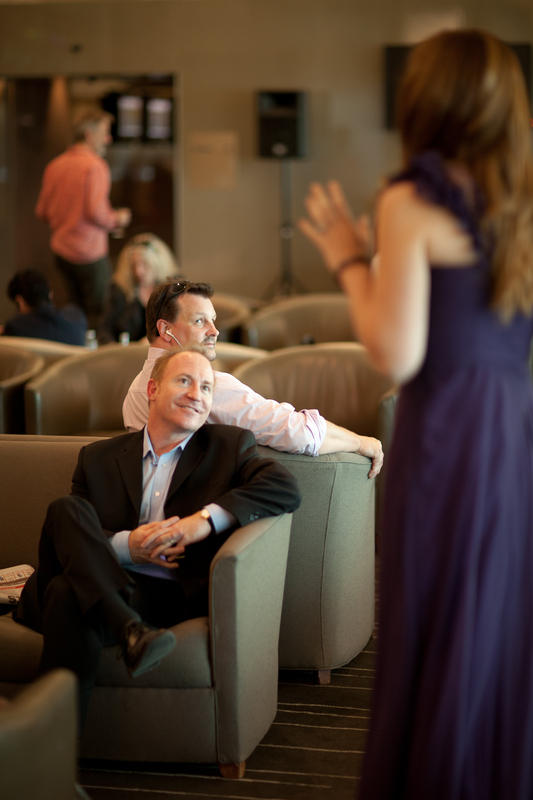 Qantas surprised customers in its lounges with impromptu performances from Opera Australia of classic Opera songs. Created by PLAY Communications, the agency turned the lounges into stages. How delighted does this bloke look? 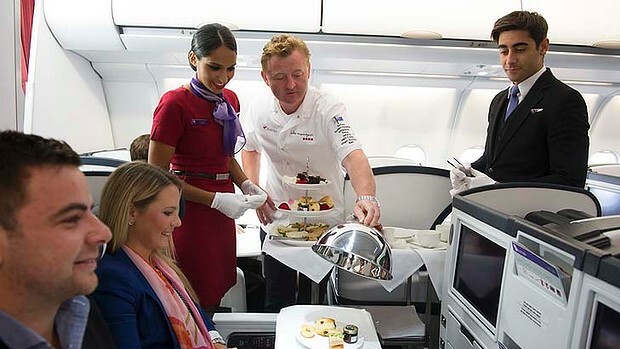 In October last year, customers on board a Virgin Australia flight from Sydney to Perth were surprised with high tea at 40,000 feet to celebrate the chef Luke Mangan’s three year anniversary with the airline. To showcase the new flavours for Crust Pizza, Aussie agency Traffik built a portable dining table and drove it round Australia. In Finland, Finnair celebrated India’s Republic Day with a surprise boogie for the passengers. Canadian airline Westjet brought Christmas wishes to life at the end of last year when passengers told Santa what they wanted for Christmas. The luggage carousel turned into an array of beautifully wrapped goodies to those who had wished to Father Christmas.